It’s that time of year again- time for the Slacker’s recap of the Shiny and the Dull for the year. I lost both grandmother’s this year. While one was kind of expected, the other was a total blind side. Either way, both sucked. I don’t handle loss well. I don’t adult well in that way. My identity was stolen. That was fun. 3 debit cards were hacked. All at different times. Separate issue from above. My credit card was also hacked. And who the hell spends that much money at Whole Foods??!!?! I added 10 pounds to the 10 pounds from 2015 I needed to lose. Probably from a combination of my litany of meds and my reliance on chips and pizza as comfort food. Like I said, I don’t adult well. I officially DNS’ed my first 2 races- Rock n Roll LA and Spooner’s Cove Trail Run. Grrr. Ok, ok, enough Dull. Bring on the Shiny!!!!!!! I started 2016 by kicking goals to the curb. I do not regret that decision. As far as I am concerned goals can get taken out with the trash. They work for some people but they do not work for me. I did not miss them this year and I will not miss them in 2017 but, oops, spoilers. 😛 So why did my goal free year work for me? I ran 12 races this year. 6 half marathons, 1 8 mile race, 2 10k’s, 2 5k’s and a little something else😉😉. 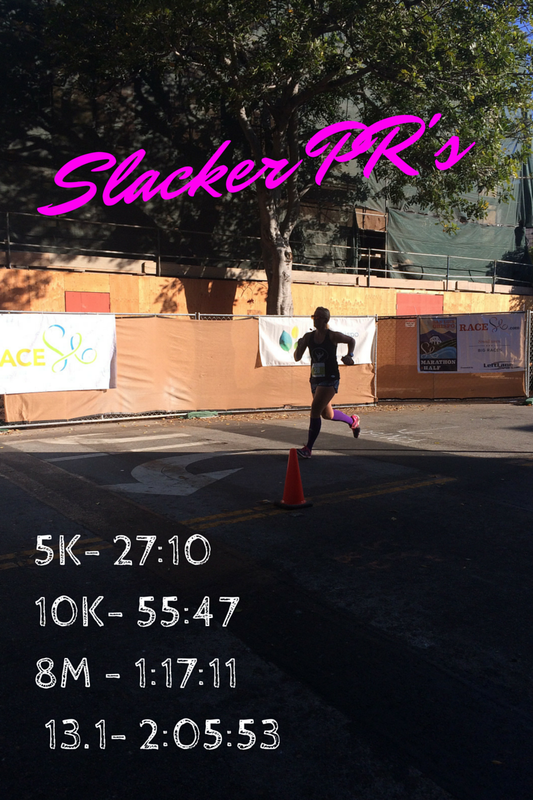 Fewer races than previous years but I tried to approach this year differently. As of the time this post goes up, I have run 850 miles in 2016. 100 more than my highest previous year. Woo hoo! Do I wish it was higher? Sure. Had I not had such a lackluster November and December I might have come close to that ever elusive (for me) 1000 mile mark. One day I will get there, until then I can dream right? 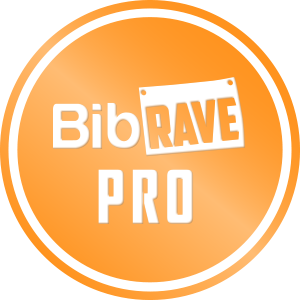 I had the opportunity to join Bibrave. Join a group of runners where we can talk about running and races all the time??? Sweet! I’ve also been able to meet some of them in real life except I’m fired because I now realize I’ve never taken pictures. Boo. I’ve had the opportunity to try some really great products too. Which is awesome because I use a lotof them on a daily basis now. I road tripped to 3 races- Huntington Beach for one and San Francisco for two. I went to Disneyland twice. This from the person who used to never go anywhere. Woah there! And that little something else race? 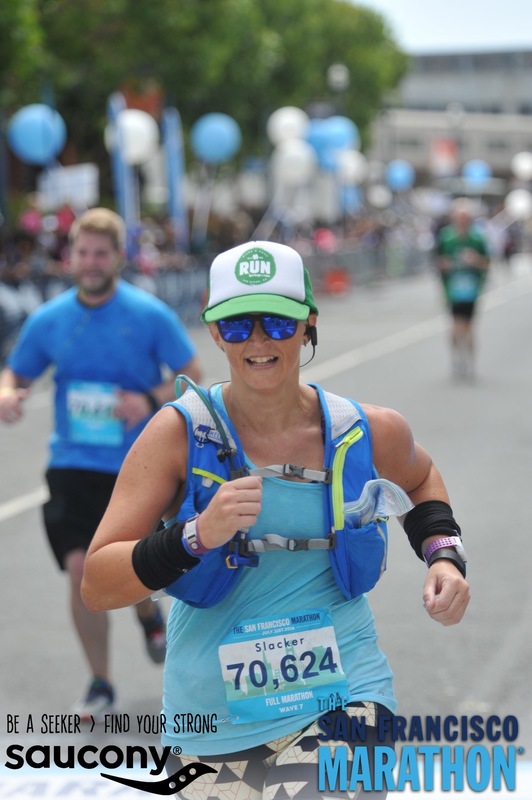 I TRAINED for and RAN a freakin’ marathon!! This from the Slacker who said she would never run a marathon. Not only was the distance daunting but I couldn’t imagine that I would ever stick to the training. I am not the type to voluntarily get up early and run 20 miles on my own. And yet I did and I was smiling at the end. Ok, smirking. Even more surprising was the marathon itself. If you followed along during training, you know I was a hot mess in July leading up to San Francisco. When I left for race weekend, I was seriously considering dropping to the half, I was still thinking that when I picked up my bib. Then race morning dawned and I was cool as a cucumber. I had no doubt I was going to finish… and I did. Without hitting a wall. Who am I???? Granted I was slower than I wanted to be and went over 5 hours but you guys I ran a marathon! And somehow looked like that after 25+ miles. 2016 had a mix of the shiny and dull. I let myself get mired in the dull a little too often. It’s something I need to work on. Overall, there were some really Shiny moments in there though. As for 2017? More on that to come. I am reading this hoping my 2017 year end review says ‘I ran a freakin marathon’ too!! Great post and well done with your running! My Shiny was my twin nieces being born and my sister getting married. 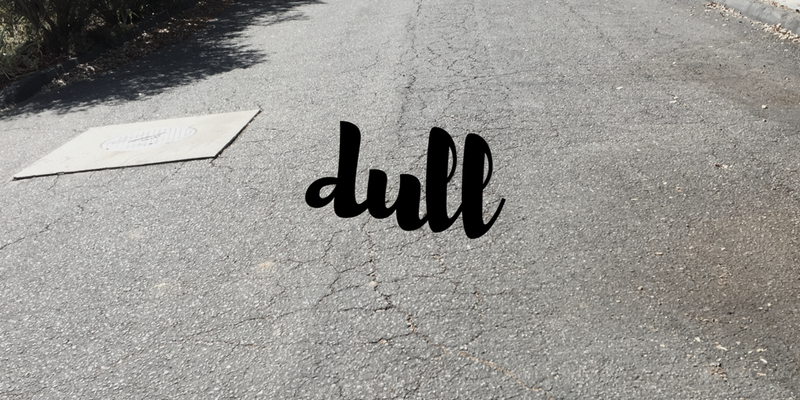 My Dull was….well I don’t really have any 2016 was pretty kind to me, thankfully! Thank you! Good luck with marathon training in 2017! Nice, congrats on your nieces! Twins sound like a handful. 🙂 Glad to hear you had a good 2016! I think it is always easier to focus on the dull than the shiny- sorry about all of the dull crap you’ve had to deal with. Sometimes I don’t recognize the last four digits of my debit card because I have had it changes three times in the last 2.5 years (2x hacked, 1x bank security issue) … fortunately my bank is awesome and never had any further issues. I think you had a pretty awesome year of running – sure there were ups and downs, but you did a bunch of races, logged a bunch of miles and – ran a marathon! Pretty awesome! For me? 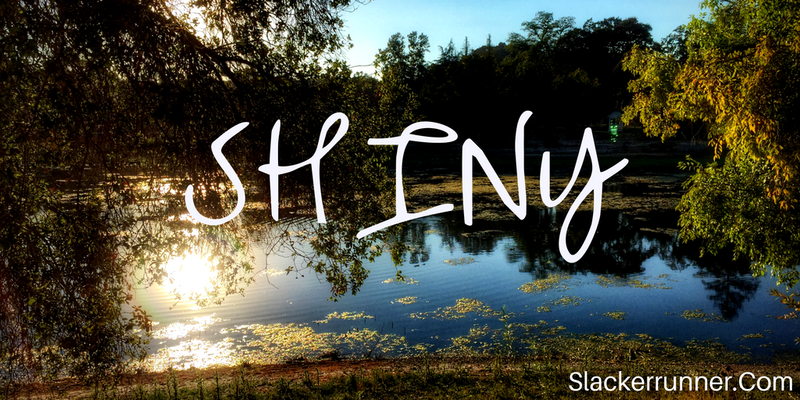 Shiny is … well, loving empty-nesting with Lisa, having two amazing kids in college doing well, staying healthy, great year at work and with running. Here’s looking forward to 2017! I’m so sorry you and your family had to go through that stress! I am glad to hear that it wasn’t anything too scary like a tumor though. Sorry the boys have to deal with the stress of anxiety issues though, those are never easy. 2017 is going to be interesting but I am going to what I can to stay optimistic. It’s a lot easier said than done. Hugs for the dull and yay for the shiny! I’m so sorry about your grandmas, and the other dull things 😦 Your shinies were pretty darn shiny! Congrats again on taking that marathon down!! You look so strong and determined in that race photo… I would be amazed if I looked that good after 25 miles! My dull: my debit card got hacked this year, too. Someone decided to spend an inordinate amount of money at Pandora Radio and then tried to buy a Lexus. Hello?! As if my bank account has enough in it to cover a Lexus… heh. At least that caught my bank’s attention! Proving to my bank that I didn’t have a spending problem re: internet radio was fun. My shiny: Finding out that I’m going to have a baby was pretty shiny… once I got over the shock and terror 🙂 I also beat two PRs this year, and got to travel, so that was pretty shiny too. May 2017 be full of the shiny! Haha, sure, let’s put a car on a debit card. Don’t thieves realize those cards have purchase limits? When one card was hit, the fraud department called and asked me if I was in Texas at a bar. Ummm, no? It’s 8 in the morning, I’m on my way to work! I’d say a baby on the way is a pretty big shiny!!!! It’s so exciting!! You’re going to have an epic 2017! Way to look good in your race photo! I always look terrible. Dull: I lost 30% of my hearing and may have to have surgery next year to correct some of it. Shiny: Running in my first race (a 10k)! I look terrible in all my other photos which is why I was so surprised to see that one after the marathon. I kind of want to find the photographer and hug them! Congrats on your first race, that’s awesome! I’m so sorry to read about your hearing loss, I can’t imagine how rough that must be. If surgery can help though that’s good news! Yup, that marathon is pretty awesome! The same happened to me- I was NEVER the kind of person who would get up before dawn to run 20 miles…until suddenly I was! It’s insane how much can change in a year. My high was probably running Reykjavik half in August, and my low was probably November-December: lost my job, my landlord is selling my flat, and I broke my ankle…or ruptured it…or something. Not ideal, but all things said I still think it was a pretty decent year. Right!? And the scary part is that I want to do it all over again! Now your flat too?!?! I’m sorry! You’re really having a rough few months. I hope things turn around soon!! Thanks Fallon, I’m sure they’ll turn around soon. I’m doing everything I can to make that happen, and I just have to hope the universe conspires to make it work out! I’m sorry for your losses last year. But congratulations on such big accomplishments! I know 2017 will be great for you! Thank you, the year definitely had it’s ups and downs. Fingers crossed for 2017. Hope yours is a great one!